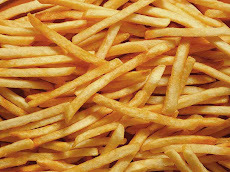 The first thing that strikes one about the French fries at Nifty Fifty’s is the variety. Their fries come in cheese, spicy, spicy cheese, chili cheese, spicy chili, BBQ beef, BBQ beef cheese. I’m guessing you see a pattern here and I know there could be more if they tried, just based on the listed combos. Their chicken nuggets have similar varieties. On first impressions it might seem like they are trying to cover something up with these elaborate toppings – and they are. The fries are natural regular cuts, nothing spectacular, while similar to Five Guys in appearance they are nowhere, I repeat, nowhere near as good. I got just regular fries with none of the toppings but there was still a hint of seasoning, maybe just bad preparation. 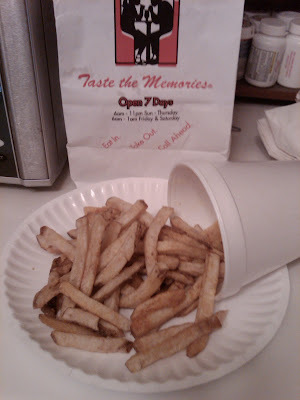 The fries were lukewarm and soggy, from both grease and condensation. These were just really bad fries. No wonder they offer so many toppings to cover the fact up. 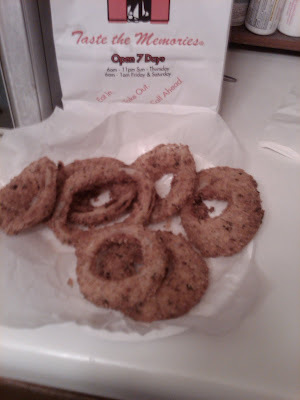 Nifty Fifty’s also has onion rings. These are big thick chunks of onion rings, obviously ‘home-made’ as advertised and evidenced by the haphazard way they have been battered – and that’s not necessarily a bad thing. These were more onion than batter and had a pleasant Italian seasoning to them. The rings were cold when I got them home (less than ten minutes in a closed bag), much as the fries had been just moments after I ordered them. One just assumes food should be hot when you order at drive-thru. I’ll give NF the benefit of the doubt and say the rings had time to cool. Onion rings rarely nuke well so I put them (seven of them in the one order) in the oven for a few minutes. They’re pretty good, not great. In all honesty I think I could make ‘em better myself at home. So the rings are okay, and the fries bad, and the chicken nuggets questionable. If any of those are on your stomach’s agenda, I suggest you steer clear of Nifty Fifty’s.